Pikapika Fantajin is the third studio album by Japanese singer Kyarypamyupamyu, released on July 9, 2014. The album peaked at #1 on the Oricon Charts and has sold 70,256 copies. The introduction track Pikapika Fantajin starts off in such an unexpected way with all these strings, it sounds so fancy for Kyary compared to her usual style. But then ofcourse the synths and sparkles come in and the whole thing just becomes like this remix of a regal introduction. I remember calling Kira Kira Killer my favorite A-side of the era, let’s see if I still feel that way. I still like the energy in the song though, it kicks off the album in a very nice way. Sure, the lyrics don’t make any sense, but this is probably your go-to song if you’re in an overly happy mood and don’t care. Despite the toy piano opening Yume no Hajima Ring Ring -album mix- this song isn’t as quirky as some of Kyary’s other songs. It has more of a pop vibe with electric guitars and synths and I like her take on it. In my current mood I actually like this a bit more than the previous track, but with Kyary’s music I never know what to expect at certain moments. Another A-side and actually the only one that I could recall. Mottai Night Land is a fast paced quirky creation and I wasn’t very surprised that this was Kyary’s new Halloween themed song. There are some spooky little elements woven into the song but ofcourse it’s all happy. I liked that piano tune in the middle of the song. Not her best A-side but it’s very enjoyable nonetheless. Serious Hitomi caught me totally off guard here because it opens with all these electric guitars! It’s nice to hear this as the first new track on the album because it actually sounds promising. I like what Nakata did to the arrangement, Kyary’s first rock song is pretty awesome and it stands out in a very good way. Random, but unique and catchy. So I don’t know the original capsule version, but Kyary’s version of do do pi do doesn’t fully capture my attention. The chorus is quite catchy (but well, just repeat the title words yourself and you can make it catchy even then) and I like the central role of the piano in the music, but I’ve heard better, even from Kyary. Family Party -album mix- was never my favorite A-side, the verses were even better than the chorus this time around. If I have to describe this song in just three words/terms, it would be: 8bit, cartoon and video game. I couldn’t even remember this from when it was released, I think that says about enough. It’s not terrible, but I just don’t really care for it that much. Quite a pick-me-up after the previous song with Ring a Bell, which has this amaaaazingly catchy chorus I almost start to hate myself for singing along to it. It’s one of the new songs and it has this nice fantasy sound to it. The lyrics are mostly in English but even though they don’t make any sense at all (‘Let’s go to the studio / I’m happy today‘ is about all there is to it) it’s pretty much fun! It’s hard to stay original after three albums of this kind of music and Tokyo Highway proves that a bit if you ask me. As always it’s pretty catchy, but the chorus tends to drag and it sounds very much like some of Kyary’s older songs. It has a nice quality to it, but I can’t imagine myself listening to this more than once. Oh wow, such a change with Koi Koi Koi because of the minor tones in the music. It’s so… atypical when compared to the rest of the songs on the album. It’s actually nice for a change because it’s also a bit more minimalistic with just a piano, xylophone and bells. I don’t particularly like the melodies in the chorus, but the change is still welcome. It has grown on me after a while. 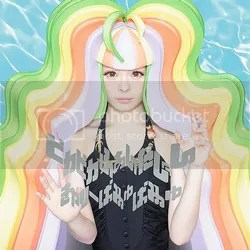 Darn it, Kyary… Sungoi Aura -album mix- was the B-side I really didn’t want to see here. It’s like her fastest song ever and the piccolo takes the cuteness and crazy themes to a whole new level. I never really liked it and even in this new context it still doesn’t work for me. It could’ve been fun, but she has taken it a bit too far with this one. A marching band opens the final song, Explorer, which was quite nice. But then Kyary herself destroys everything with bad vocals… She doesn’t have a great voice to begin with, but this is beyond bearable if you ask me. Again the concept of the song is great, just like Sungoi Aura, but the execution is just lacking. 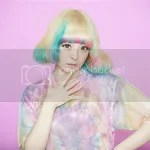 Such a shame, Kyary!